Velvet is in this holiday season. If you didn’t know this, well now you do! I’ve always been a fan of velvet. 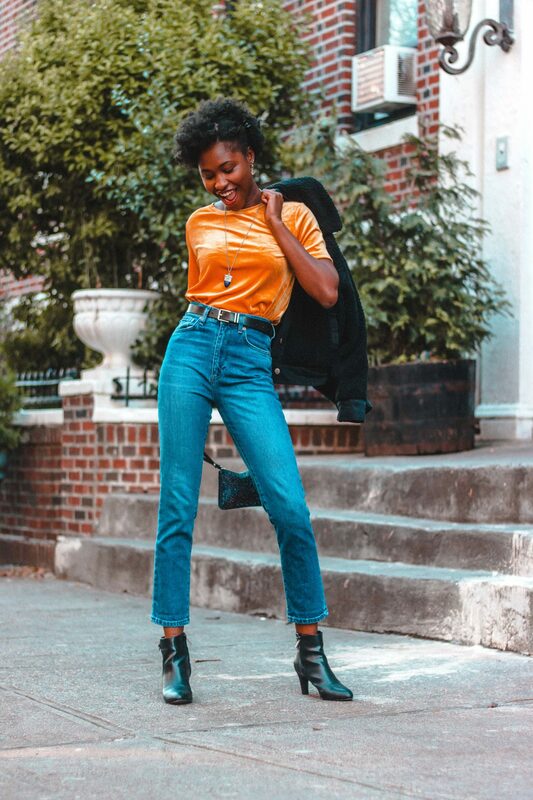 There’s something very fancy about the fabric that instantly makes me feel a little bougie, which is why I got this Relaxed Velvet Tee in Tobacco Leaf (cool color name) from Old Navy to spice up the season. I’m in love with this relaxed tee. You can pair it with almost anything and it completely transforms your outfit! In this first look, I wore the tee with a pair of high waisted denim jeans, a teddy jacket, and black booties. A simple yet very cute look for a date night, or an evening holiday party. I also added a few accessories including a Glitter Wristlet (also from Old Navy), a belt and a necklace to give it a bit more personality. For the second look, I paired the tee with a striped skirt and ankle boots. I kept the accessories to a minimum on this outfit. Only adding hoop earrings, just because the skirt and booties added so much more detail to the outfit and anything extra would be too much in my opinion. This look can easily work for any daytime festivities. I didn’t wear stockings on the day I shot this, because it wasn’t that cold, but if you need to definitely go for it. Being cold ain’t cute. Are you into velvet this season or is it not your thing? Let me know in the comments! Previous Post Look Good Feel Good with Wish Supply Co.